You are browsing the archive for CRL. I was doing a EMS POC and deployment of certificates on mobile devices was a requirement. So I needed to setup an NDES server with a separate Subordinate CA for MDM , NDES Server and SCCM Certificate Registration Point (CRP). Big deal I thought as I did it a already multiple times. At my customer we worked close with the server team and setup the infrastructure which was working fine at first sight. 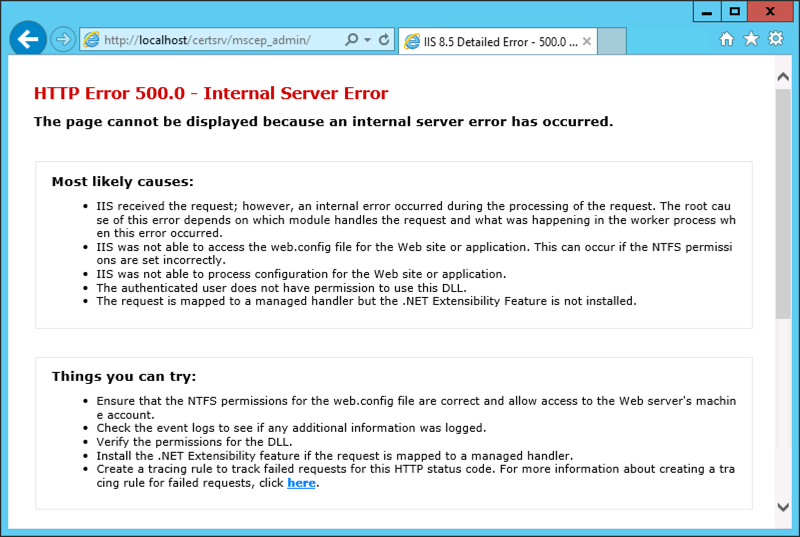 After a reboot of the NDES server I was struggling to get the Network Device Enrollment Service (NDES) up and running again as it would throw me an error 500. Enable CAPI2 logging by opening the Event Viewer and navigating to the Event Viewer (Local)\Applications and Services Logs\Microsoft\Windows\CAPI2 directory and expand it. You should see a view named Operational.Next, right-click on the Operational view and click the Enable Log menu item. When I finally tried to download this CRL Delta file, it failed. I remembered myself, that IIS is treating the + sign very differently in URL’s. After enabling this, NDES was able to retrieve the Delta CRL file and start the service gracefully. So if your NDES Server is throwing “The Network Device Enrollment Service cannot retrieve one of its required certificates (0x80070057). The parameter is incorrect.”, do not only check your certificates on the Server, check also your CRLs and Delta CRLs!